Considering needs for things like mail, magazines, or even paper towels and napkins, paper probably isn’t going to be going away soon. Despite new technologies offering electronic alternatives to paper, statistics on paper use in America and across the globe are stunning, with the average American consuming more than 700 pounds of paper each year. While in the past much of the paper used in homes and offices was trashed and sent to landfills with other waste, with the help of recycling processes, there are now greener ways of throwing out trash. The paper shredding industry is no different. With governments, businesses, and individuals alike taking up the call for an environmentally-sustainable society, shredding companies have met this need using strategies like recycling in order to provide sustainable options and services for shredding sensitive information. Below you can find in-depth white paper as well as supplementary articles and related videos on sustainable shredding services. Learn more about how the today’s greener shredding industry works to benefit both our customers and environment with related information and resources. Check Out the White Paper and Articles Below to Learn More! For an industry which revolves entirely around destroying paper waste, it can be hard to initially imagine how paper shredding can contribute to environmental sustainability. Throughout this in-depth white paper, we take a closer look at how paper shredding providers are stepping-up on sustainability out of recognition for the value of creating a greener shredding industry. Learn more about environmentally-friendly strategies like recycling are helping to offer a greener way to destroy personally identifiable information here. Interested in learning more about Secure and Sustainable Shredding? Check out these articles, videos, and more! How Do Shredding Services Stay Green? Generally speaking, paper shredding services simply take trash and turn it into smaller trash—but who says there isn’t an environmentally-friendly way of doing it? On par with the same green goal of basic recycling services, shredding companies are also adding paper recycling into their destruction processes, but with the extra benefit of privacy protection to sweeten the deal. The movement to “going green” is more popular then ever, and will continue to grow. Why not take the right steps in becoming a sustainable company? Not only will it benefit the environment, shredding your documents will also keep your company’s information safe. Many people don’t know that you can’t throw shredded paper into the recycling bin. Many recycling centers find shredded materials too difficult to sort and recycling, so they don’t accept them. Learn how using a shredding service ensures that your shredded papers get recycled and keep the planet healthy. With increasing risks for identity theft and fraud, more people are adopting shredding services to protect their information, however many are afterwards left with the question of what to do with the leftover shreds. 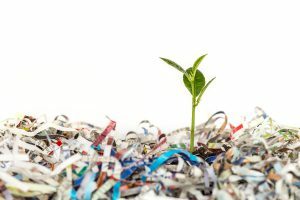 Learn more about how you can put shredded paper back to work and make document destruction an environmentally-friendly process here. The need and value of environmental preservation is becoming increasingly clear, but with the help of green shredding practices, homes and businesses alike can take advantage of document disposal services that provide an ideal balance of both security as well as sustainability. To get free sustainable shredding quotes from top providers and locations in your area, just give us a call at (800) 747-3365, or simply fill out the form on the right.